EPIC SUMMER BEACH DAYS... THE BEATER IS ALL ABOUT FUN! - Created by the freaks at Catch Surf, the Beater Original body board is destined to take over the world. It is the original all-purpose, fully-customizable shred stick! Surf it with or without fins, bodyboard or skim it; do whatever the heck you want. The Beater can turn an average beach day into an epic tale of radness! Now shred. NEW & IMPROVED! All-new stronger, lighter and water resistant core with dual (x2) maple-ply wood stringers and thicker/stronger bottom slick for the stiffest, most durable and highest-performing Beater ever made! Available in super-rad colors. 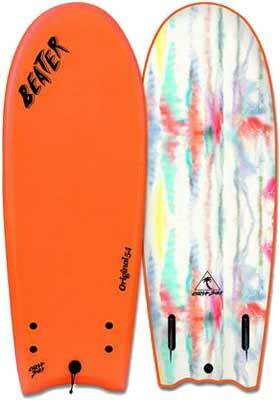 Single-Fin model comes with all-new 4.5" raked fin. Twin-fin comes with all-new 3.5" keel fins. 48" (4') x 20" x 2.5"
54" (4'6") x 20" x 2.5"